Android catching up with iPhone in web traffic | Android Blast! 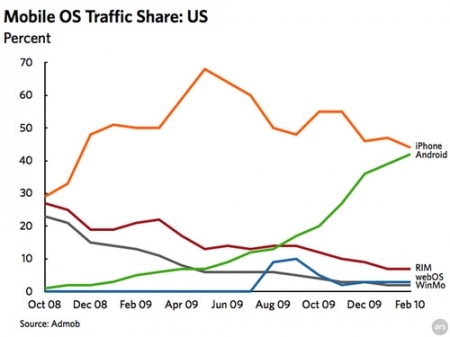 Apple's iPhone users have been the biggest reason for increased mobile web traffic over the last few years. You would think Apple would have a huge lead in this department, but a new report says Android is quickly catching up and will pass the iPhone as most used mobile OS for web access. AdMob's Mobile Metrics Report projects Android will soon pass the iPhone, thanks to the popularity of the Droid. If Android can continue this trend even for a little while they will blow right by the iPhone.